• PLOT SUMMARY: 'One Thousand Opas and a Dead Body: Part 1 - No one knows where these two warriors came from. The only thing that's clear is that they're two of most ornery trouble-making $%@# that have ever lived. 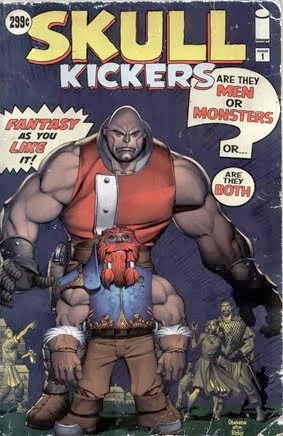 SKULLKICKERS is a fantasy action-comedy: Two mercenaries entangled in a high class assassination plot and nothing - werewolves, skeletons or black magic - will stop them from getting paid. If you love tabletop fantasy RPGs or movies like Army of Darkness, SKULLKICKERS is waiting for you! Story JIM ZUBKAVICH art CHRIS STEVENS, EDWIN HUANG & MISTY COATES. CHRIS STEVENS cover.